It would be a dream come true if every person who visited your website ended up converting or at least became a valuable lead. But you know that that’s not how it works. At the same time, it’s possible to get closer to achieving this goal by taking some actions that may turn your visitors into high-quality leads. This can have a significant impact on your conversion rate. While it’s important to optimize your sign-up forms, these aren’t the only way to capture leads. If you’re only relying on these, there’s a good chance you are struggling to improve your lead generation results. A lot of visitors may not be willing to part with their personal information. And others may not find your site interesting enough to sign up. This post will not focus on optimizing your sign-up forms. Instead, you’ll learn new, innovative ways to convert your website visitors into high-quality leads. What you need to remember is that your visitors come from different backgrounds. They may have landed on your site through completely different channels and could be looking through your website to find completely different things. By understanding their differences and delivering experiences that befit their individual needs, you can improve your chances of turning them into valuable leads. You may think this sounds challenging. But by using the right tools, you should be able to collect accurate data about your visitors and their behavior. 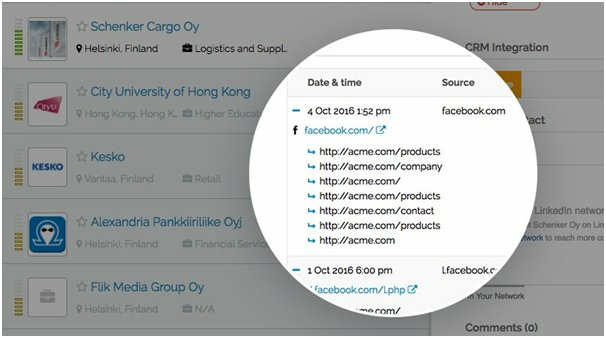 Leadfeeder, for example, helps you discover who visited your website, where they came from, and what pages they viewed during their visit. It can also update your CRM automatically in case there are any revisits. Using all this information and automatic CRM update, you can follow up more effectively with content that’s personalized according to their preferences, behavior, and interests. And even if the visitors end up exiting your site and don’t convert through forms, you can use this data in your re-engagement strategy. For example, you can find out which pages engaged them longer. And you can use this information to show personalized social media ads, displaying the products or services they viewed. You can use the Leadfeeder data to help you design ads with offers, content suggestions, and/or product recommendations relevant to visitor behavior. The goal is to ensure that visitors see ads that suit their needs and interests so that they potentially turn into leads. Someone ends up on your site after conducting a relevant Google search. But when they look through your site, they can’t find the exact information they need. Or they were viewing a certain service package and some points weren’t clear to them. There can be 2 outcomes in this case—either they leave and go to your competitors or you provide them with the help they need and turn them into valuable leads. That’s why you need to make it easier for visitors to get help when they need it. Make sure your search bar is clearly visible and FAQ section is easily accessible. Better yet, why not add a live chat support feature on your website? That way, you can quickly answer visitor queries in real time and they don’t have to wait for hours waiting for your responses. Many businesses have benefited from implementing live chat support on their website. Logical Position, for example, experienced a 150% increase in inbound leads. As you can see in the screenshot below, the live chat button is clearly visible on the right side of the screen. Visitors who need some help can just click the button and chat with one of the company’s representatives. To turn more website visitors into high-quality leads, you need to step up in the content marketing game. When visitors land on your site, the best way to engage with them is through your website content. It can be actionable blog posts, intriguing videos, eye-catching infographics, or anything that they might find valuable. You need to engage them enough to the point that they realize your value and expertise. Your content can show them how much of an expert you are in the field. After gaining their confidence, offer something exclusive and valuable that will make visitors sign up for your newsletter or subscribe to your blog post. Also, you can offer your website visitors a free ebook that will guide them on a relevant topic. Or you can offer them free access to your webinar or any exclusive content that is available only when they provide their email address. You can even go so far as to provide them with a free trial in exchange for an email address. 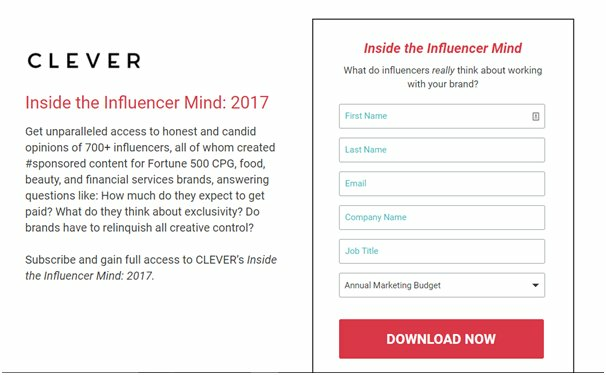 Clever, for instance, offers free access to a report on influencers in exchange for some personal information. After visitors browse through your website, you may notice that they are still leaving without signing up. Although you may not be sure of the reason, it’s a good idea to make the final attempt to engage them before they leave. Try displaying exit-intent pop-ups to visitors who show any intention to leave. These pop-ups can display some exclusive offers or opportunities that weren’t easily visible earlier. The goal is to make the visitors pause and think for a minute, which can hopefully end up in a lead. 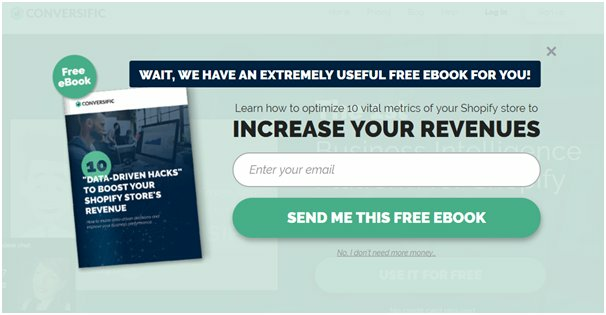 Here’s an example of an exit-intent pop-up from Conversific, offering a free ebook to visitors. But make sure you optimize these pop-ups in such a way that you deliver these to only the most relevant visitors. For example, instead of displaying exit pop-ups for each and every visitor who’s leaving, you can show these to visitors who have spent some time browsing through your site. Or you can customize the offer according to visitors’ behavior, such as the pages they seem to be most interested in. These are some of the best ways to turn your website visitors into high-quality leads. As you can see, it’s all about delivering a personalized experience to your visitors and enhancing their experience in such a way that they feel valued. Got any questions about the points? Let me know in the comments. Thank you for the tips! It all depends on the niche! Test and adapt!